With her heart sworn to the warrior prince by her side, and her fealty pledged to the people she is determined to save, Aelin will delve into the depths of her power to protect those she loves. But as monsters emerge from the horrors of the past, and dark forces become poised to claim her world, the only chance for salvation will lie in a desperate quest that may mark the end of everything Aelin holds dear. Aelin Galathynius is waging a war against the dark forces of Morath, where Aelin is now a princess of Terrasen, her title of Queen devoid as the kingdoms of Erilea renounce the young Queen as heir, unless she is able to determine her worth. And Aelin Galathynius, Queen of Terrasen, knew the time would soon come to prove just how much she'd bleed for Erilea. Manon Blackbeak has been summoned by Perrington, the demon lord who is determined to regain the city of Rifthold where Iskra Yellowlegs will command the Ferian legion. Dorian Havilliard, the King of Adarlan, is unable to defend his Kingdom against the onslaught of iron clawed witches, fleeing his city to find the young Fire Queen while one of Manon's Thirteen will be sentenced to death in order to preserve the Wing Leader's secret. Elide Lochan is fleeing towards freedom after being liberated by Manon and the Thirteen. Ordered to head North to deliver a message to Celaena Sardothien, and determined to find the Queen of Terrasen, Aelin Galathynius. Branded a thief and murderer, Elide is being hunted to be brought to the King for justice. Lorcan is pursuing the young woman through the forest, limping and fleeing. Promising to protect Elide, the Fae warrior seeks to end Aelin, deceived by the Wyrdkey the young Queen still carries. While Erilea lies in devastation, Aelin will need to all upon her allies and foes alike to recapture her country. A promise of a future bereaved of borders, of suffering and a Kingdom she will command once more. In her much anticipated fifth installment in her Throne of Glass series, Sarah J Maas has woven an immense storyline that will consume readers until the final page. 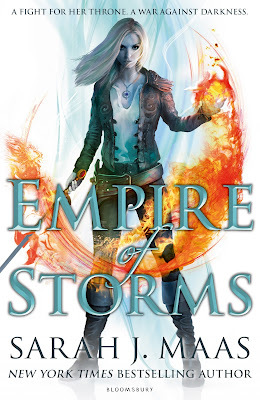 Sultry and fierce, Empire of Storms was magnificent but it could have been extraordinary. Aelin is tenacious, decisive and a fierce competitor. Throughout the series, she's grown into a leader among men while still maintaining a sense of humility. Her journey has been remarkable and her character forged by those who aspire for freedom. Aelin will need to call upon her allies against the dark forces that oppress her Kingdom while deprived of her title as Queen. While in previous installments I enjoyed the dynamic between Aelin and the Fae warrior Rowan, in Empire of Storms, Rowan was dispensable. He contributed scarcely throughout the storyline, discounting the sexual tension. Elide is a character who I find intriguing and absolutely delightful. Having escaped imprisonment and aided by Manon, with only her senses and a token from the depths of Rifthold, Elide is determined to return home to Terrasen to assist her Queen. While being hunted, Elide and Lorcan form a partnership. Lorcan, Maeve's blood sworn Fae warrior has been deceived by Aelin but along their journey he begins to care for Elide. Although I wasn't an advocate for Lorcan previously, I enjoyed the tentative bond between he and Elide. She's intelligent, kind and thoughtful, while Lorcan is fiercely faithful and begins to understand Elide's harrowing journey that has forged the young woman she is today. I admired how their relationship was based on a mutual appreciation and although both characters are a complete contrast of one another, it felt authentic and I adore Elide for her courage and compassion. Dorian is destitute. His Kingdom of Rifthold left devastated and in ruins, forcing the young King to retreat. Lysandra and Aedion have established a connection and while I adore Lysandra and her moxie, Aedion is incredibly tedious. Manon is incandescent. My goodness how I love her character fiercely. Her character development has been magnificent and although I was hoping for a satisfying romantic interest for her narrative, she's a character that has transformed herself from cold, brutal and bordering on savage to a fierce young woman who is beginning to allow herself to experience emotion beyond the pleasure of blood lust. Her storyline utterly captivating. Manon and her Thirteen have been the salvation of Empire of Storms and I'm anticipating her own personal journey in the finale. My affliction with Empire of Storms was the romance, primarily how it threatened to overwhelm the storyline. Each character has been allocated a potential love interest and given the circumstances, some seek solace sexually in one another. While I applaud authors who write sexually positive experiences, the scene between Aelin and Rowan felt farcical and left me longing for Chaol. The storyline foundations were absolutely brilliant, Aelin calling upon former associates and adversaries to amass against an empire of darkness and oppression. While her motives may seem narcissistic, Aelin will unite the Kingdom of Erilea. Beautifully written, Sarah J Maas wields words like weapons, intoxicating and enticing readers. I cherished Empire of Storms regardless and now eagerly await what promises to be the most anticipated finale in young adult since Mockingjay. Sorry it wasn't QUITE as amazing as you thought it could be, but that's great you still loved it overall. I haven't read any of these books yet, but I do hear really good things! The series really is incredible Lauren, so many fierce female heroines. I'd love to see what you think of the original, Throne of Glass. I typically feel the same Resh, especially when it comes to fantasy. It's actually one of the few fantasy series' I really enjoy and the books are incredibly easy to read. They look daunting, but they're really not. Definitely give Book one a read, you'll be hooked. Not at all Haniya, there are lots of bloggers and readers who have yet to read the series. I do hope you give it a read though, it's absolutely brilliant. I've heard REALLY mixed thing about this one. I'm glad it (mostly) worked for you! It was a great read Karen, but the romance was a bit Too overwhelming at times. It's going to be an epic finale though, probably the most anticipated since Mockingjay. Ah! l still haven’t started this series yet. I know! Bad Sarah! Very bad Sarah! I own the first four books (if only my yearly reading capacity matched my book buying addition). I’ll get there eventually and be super disappointed if I don’t enjoy reading the first book haha, but I’m sure I’ll love it. Hopefully I’ll have forgotten any spoilers I’ve read by then. I'd try to steer clear of reviews for the finale, as I have a feeling a few characters may not survive. Perfect time to start the series while you wait Sarah, you won't regret it. Man, I have so got to read this series! It always gets great reviews! Ohhh you so do Verushka. It's an amazing series that has gone from strength to strength. This is such a beautifully eloquent review Kelly! Manon and Elide were the standouts here for sure, but yeah Rowan definitely took a back seat in this one. AND I MISSED CHAOL SO MUCH. Lovely review Kelly! Aww, thanks Jeann. I wonder if it was because Rowan was much more dominant in Queen of Shadows, so she wanted to tone down his character. But CHAOL! What was the deal with that? I really liked this book but I missed CHAOL SO MUCH!!! He is definitely one of my favorite characters and I used to ship Chaolena with so much passion in the past!!! Hahaha!! !